Active Trader is a multi strategy Expert Advisor with preset daytrading strategy. A control panel permits getting the most out of the market. 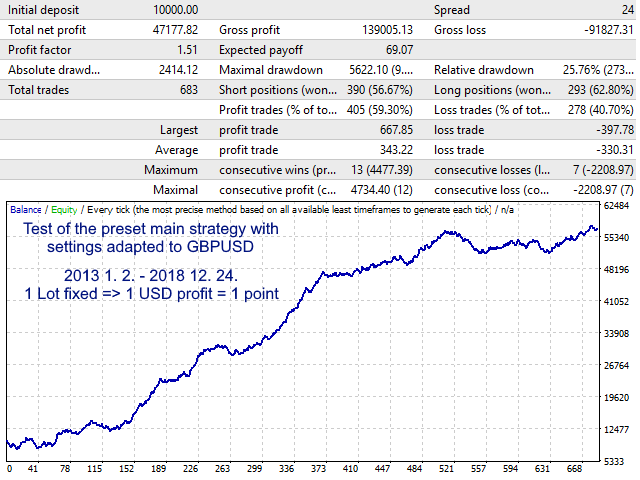 A integrated strategy builder can change the preset algorithm or the user trades own ideas. 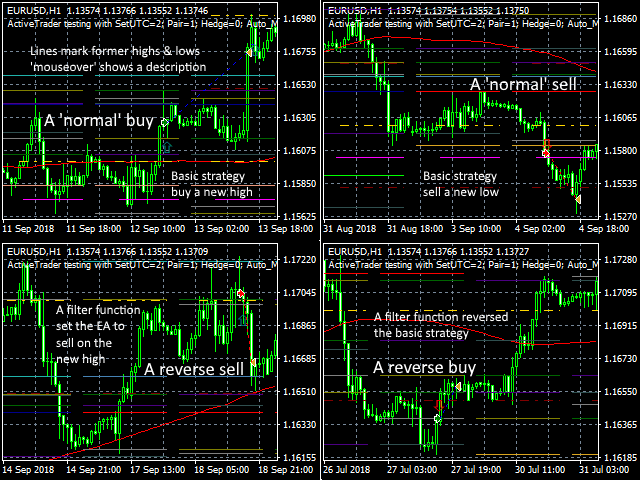 Active Trader works in any currency, default settings are for EURUSD H1 chart. Set files for other currency pairs are in the Comments section. During live trading the control panel in the chart permits easy intervention in the trade. In tests with historical data the control panel becomes a trade simulator, e.g. to learn trading with trendlines, another strategy of this EA. 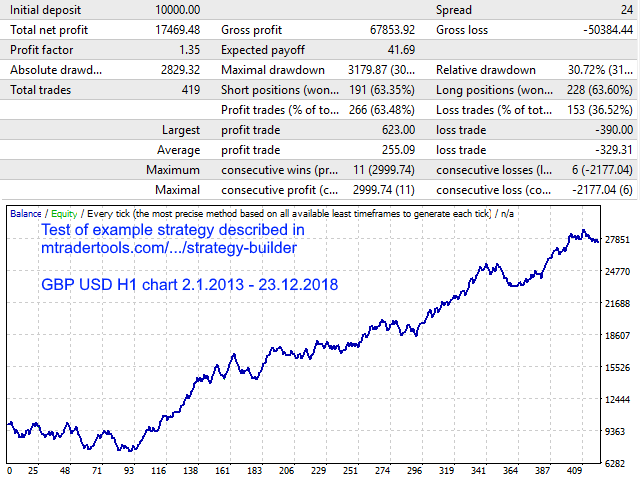 The control panel and the strategy builder make testing and trading of own ideas and strategies easy. First account was deactivated by Roboforex. The preset main strategy trades after a new 3 days high or low. Always just one order with StopLoss. No martingale, no grid, diversification on several pairs can lower overall risk. Active Trader's main algorithm can be seen and modified. The basic strategy is improved by filters that base on the relation of highs and lows of days, weeks and month before, which are marked in the chart. The filters are explained in the chart and can be de/activated and tested together with other filters or standalone. 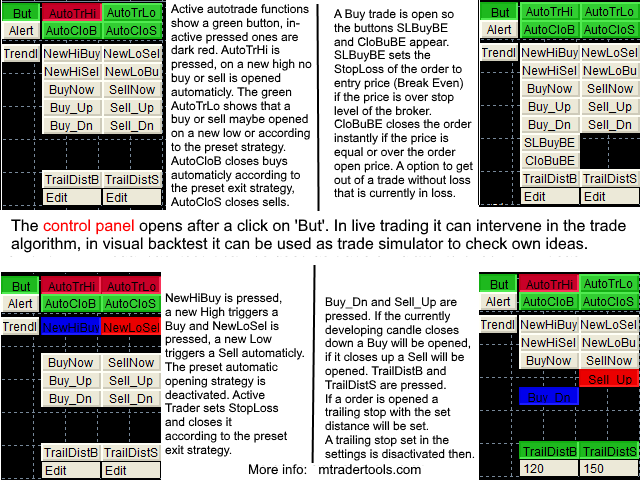 Active Trader can be used fully automatic with the given algorithm or the user changes it. Or Active Trader is used semi automatic. Trader who don't want to 'leave it all to a machine' can easily intervene in live trading. A preview function shows if a buy or sell will be opened before the trade is triggered. By the control panel the decision of the EA can be modified before it opens the position. 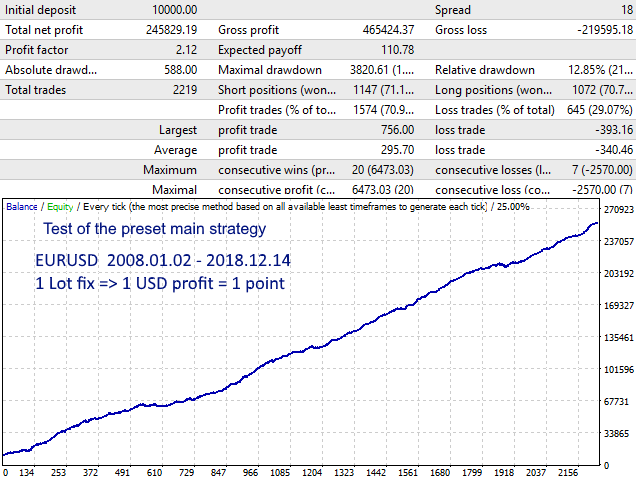 For a open trade the preset exit strategy can be modified. Test it in visual backtests! 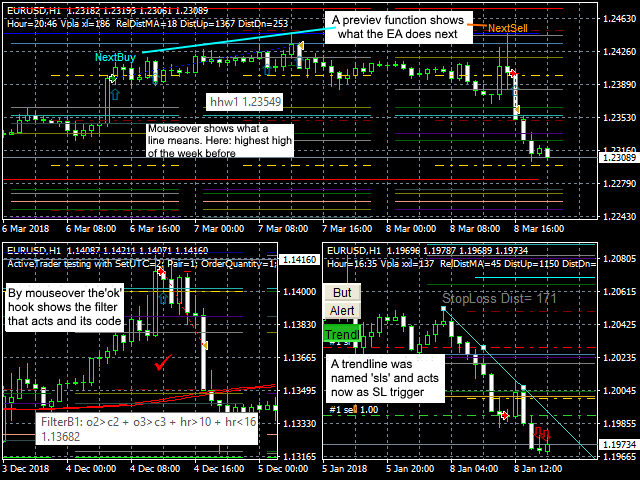 Understanding strategy and features of the EA enables active traders to get the most out of the system. Sometimes a algorithm can fail but even a little trained trader can improve the result. Active Trader draws relevant filter-trigger lines and trendlines into the chart. These or own trendlines can work as order open trigger or StopLoss line, simply giving the line a corresponding name. Important parameters are shown as comments in the chart, particularities like unusual chart constellations are marked. For a correct backtest you must download M5, H1, D1,W1 and MN1 data for the tested period! M1 is not necessary and makes the test very slow. For more info see the Comments section! SetUTC - timezone setting. Default set UTC=2 is used by many brokers. DrawLines: horizontal lines in the chart show high and lows of former days, weeks and month.